On Church Street in San Francisco near the intersection of Market Street — a nexus of light rail, streetcar, and bus lines — a simple but potentially transformative street improvement was put in place over the weekend. The center lanes of Church Street between Duboce Avenue and 16th Street were painted a bright, fierce red, signaling that these lanes are prioritized for transit and taxis. Near Church & Market, looking north toward Duboce Avenue. Click image for full-size photo on Flickr. 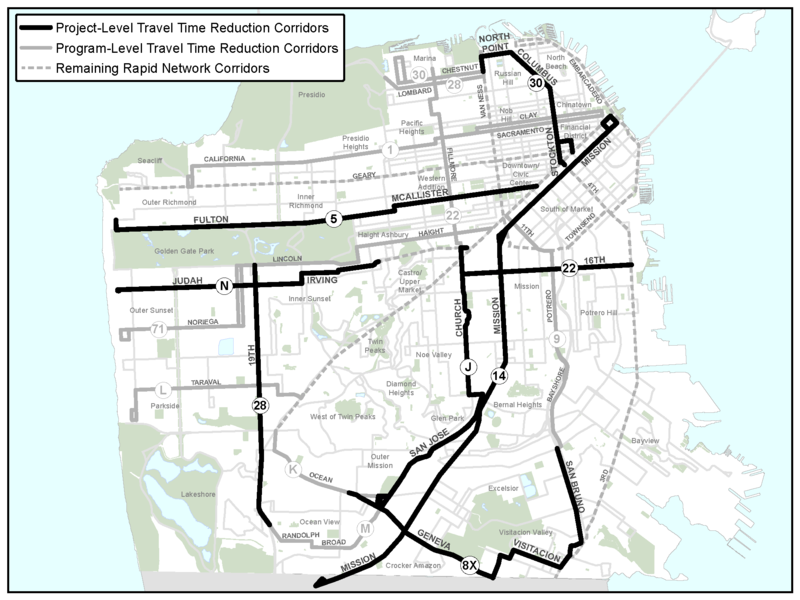 The painted lanes are a preview of the commonsense flavor of improvements that the SFMTA’s Transit Effectiveness Project (TEP) proposes to implement as a means of improving travel time and reliability on the “Rapid” network. This network includes Muni’s most heavily used routes, including the J-Church and 22-Fillmore, both of which use Church Street and experience among their most crowded loads on this particular segment where the two routes overlap. If the center lanes are kept clear of cars with a combination of visual cues, signage, and enforcement, transit vehicles can access boarding platforms more promptly while motorists use the outer lanes. The transit-taxi lanes are coupled with restrictions on left turns between 7:00 a.m. and 7:00 p.m.
Church & Market. Click image for full-size photo on Flickr. The Church Street project does not address any number of other pinch points and constraints that impact the quality of J-Church and 22-Fillmore service, but it is characterized as a “pilot” because it gives the SFMTA, even before environmental review for the TEP is completed, an opportunity to monitor how this type of street treatment performs in a confined area — a microcosm with different transit vehicles, as well as a mixture of commercial activity and residential driveways. The bright color literally gives more visibility to the SFMTA’s efforts, and with over 15,000 riders passing through this short stretch of Church Street each weekday on the J-Church, 22-Fillmore, or 37-Corbett , a substantial number of people stand to benefit from the pilot, while also getting a small taste of what is in store. This part of town has become something of a TEP preview showcase, first with the more spacious boarding areas built for the N-Judah, and now with painted transit lanes joining the mix. Each one of these improvements taken unto itself may be small in scope, but when implemented incrementally at key locations throughout the city, collectively, they can make a tangible difference at relatively low cost. This reflects only the lines that use Church Street. It excludes the F-line and Muni Metro subway and thus represents only a portion of the total number of transit riders that pass through Church & Market each day. I like the color scheme– very reminiscent of old-school Muni. This is a step in the right direction. The cooperation of motorists and enforcement are keys to it’s success. As a long time regular J rider from Noe Valley I can tell you some mornings it’s like a crawl through this section of the line. The other slow spot is further out where numerous stop signs (5 in a row in one spot and 12 between 22nd St and 30th St including a slowdown or stop for a switch – with only 5 of these passenger stops). Nice to see you back Eric. Noticed these yesterday, and also noticed cars blithely using the lanes. Without any messaging to cars that they’re supposed to use the unpainted lanes to the left and ride, I’m not sure there’s a lot of utility here. @stevenj – Thanks for the welcome back! If you have not seen them already, you may be interested in specific proposals for the J-Church, which include fixes for stop signs on the route and should help reduce non-revenue stops. @Greg C – I took these photos late morning yesterday so there’s only the red paint without messaging, but stencils indicating that the lanes are transit/taxi only will be added, as well as signage. I’ve always thought a hatched line patter made sense for Muni only lanes. It naturally looks like a do not drive zone to non-muni drivers, but muni drivers would know that busses ARE allowed. This would be perfect for Potrero Blvd by SF General, where the muni only lanes shift back and forth and are generally used by everyone. Why doesn’t the 22 Fillmore use the Taxi/Bus lanes going north bound on Church between 16th and Duboce?